Join Canine Behaviorist Nelson Hodges for his Lost Dog Recovery One Day Seminar on techniques, means, methods and strategies to recover lost, run away, and escaped dogs. 9am – 5pm, October 17th 2019, Includes drinks, snacks and lunch. Registration for this workshop ONLY is $150.00. Audit spots only, this event will not include dogs. This workshop will be followed by his 3-day Relationship Based Behavior Modification Workshop, October 18-20, 2019. You can register to attend only the one day Lost Dog Recovery Course or add it to your RBBM registration at checkout. Nelson Hodges, of Canine Content, will be conducting a 3‐day workshop to help dog trainers, veterinarians, vet techs, and owners better understand the behavior, brain, language, and motivations of canines. 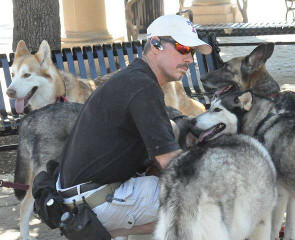 Mr. Hodges will cover how to communicate with dogs in a more natural way in order to build trust sooner, and provide the means to bridge the understanding gap that creates behavior-related problems in dogs living with humans. Nelson Hodges, IACP, ABS, CIS, has been rehabilitating animals for over 40 years. Registration for the RBBM workshop is $450.00. ALL SPOTS ARE WORKING SPOTS– so please bring your dog 🙂 If you can’t bring your dog please contact Janet Romagna and she will make every attempt to provide a dog for you. Price includes lunch all three days and dinner Saturday night. Registration is limited to 30 spots. Payment must be received before registration is valid ! All attendees are also required to fill out and return both the participation waiver and the dog waiver. $99.00 + tax per night + one time $30 pet fee rate guaranteed for 30 days prior to workshop. 13. Aggressive Dogs: Recognition, means and methods, bite awareness and avoidance. 14. Behavior WITH Training, not vs.
15. Exercise A: Being “with” – testing and trusting. 16. Hands on Conversations with the Dogs. Nelson Hodges has worked with Animal Behavior and Rehabilitation for more than 40 years. He has specialized in canine behavior, helping others to understand the nature, intelligence, language and motivations of all canines. During that time Nelson has personally worked hands-on, with thousands of canines of virtually all breeds. His behavioral cases include many of the most extreme behaviors, from shut-down fear to severely aggressive dogs, and all behaviors in between. He has been a long term advocate for understanding canine behavior and ethical treatment and handling. Nelson was elected to the Board of Directors of the International Association of Canine Professionals (IACP) for the term of 2015 through 2017. He is also a member of other affiliations in Animal Behavior and Human Psychology. Watch for our revamped web store coming soon !